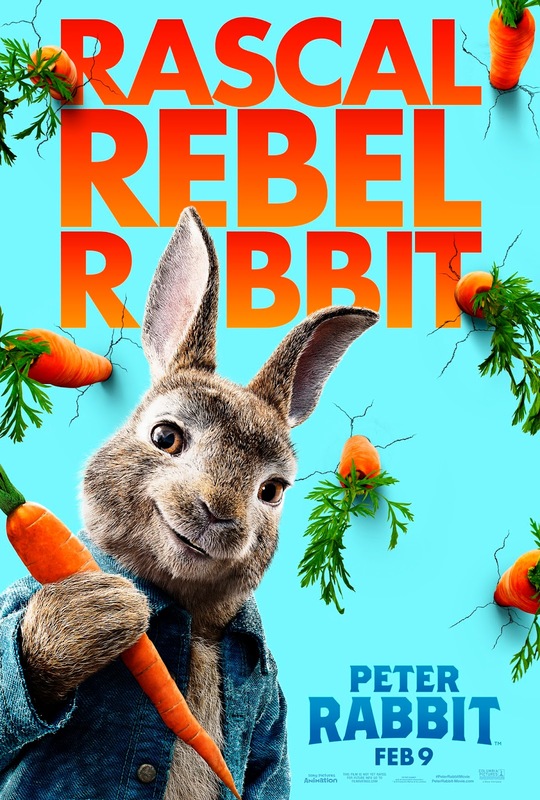 A CGI animated/live-action kids film, based on the classic stories by Beatrix Potter, about a rebellious rabbit causing mischief for a new farmer. The movie was directed by Will Gluck (who's also helmed such hit youth comedy flicks as 'EASY A', 'FRIENDS WITH BENEFITS' and the 2014 'ANNIE' remake), and it was scripted by Gluck and Rob Lieber. It stars Domhnall Gleeson, Rose Byrne and Sam Neill (in live-action roles), as well as the voices of James Corden (in the title role), Daisy Ridley, Margot Robbie and Elizabeth Debicki. The movie has received mostly positive reviews from critics (unlike it's trailer), and it's also a hit at the Box Office as well. I enjoyed it much more than I thought I would. After years of feuding between a mischievous rabbit, named Peter Rabbit (Corden), and an old farmer, named Mr. McGregor (Neil), the farmer suddenly dies due to a lifetime of bad (non-vegan) eating habits. Peter and his friends think they finally have the home, and garden they love, to themselves. Then Mr. McGregor's son, Thomas (Gleeson), inherits the land and moves in. A new bitter rivalry quickly emerges between Peter and the new farmer. It's complicated though, by a beautiful animal lover who lives next door, named Bea (Byrne), which Peter and Thomas both desperately want the affection of. I found the film to be a lot more amusing than I thought it would be; I wouldn't say it's funny exactly, but it's definitely amusing. The animation is beautiful, and the animal characters are really lovable and cute. Peter is of course obnoxiously mischievous, and Thomas McGregor is a little too unlikable as well, but the film really does play like a live-action cartoon (the type that I used to watch a lot as a kid). I don't think it's probably that faithful to the classic kids' stories though, although I don't remember them that well, but I think the film is probably a good enough modern (live-action) update. I don't usually enjoy most kids' movies either, but I had a good enough time watching this one. I think it probably helps to be an animal lover though, like I am.